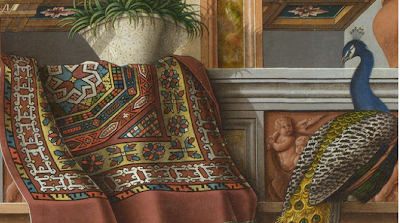 It seems that serious rug enthusiasts tend to be familiar with Renaissance artist Carlo Crivelli because lavishly detailed textiles and decorative carpets feature prominently in the Venetian painter's work. In the autumn issue, Hali explains that the "Crivelli star," a classical carpet ornament, is named for him and next month a new exhibition at Milan's Pinacoteca di Brera will explore the connection between real rugs and Crivelli's paintings. 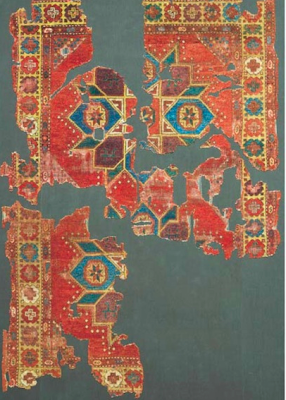 As I understand it, Italian textiles and three rugs including the 15th century Crivelli star example, shown second above via Hali, will be on view along with the art. Designers (interior, fashion, graphic) are often saying that they look to art history for inspiration, so it's always interesting to stumble across an exhibition that examines this symbiotic relationship. Unfortunately, I can't read Italian and will therefore be clueless when it comes to ordering an exhibition catalog. 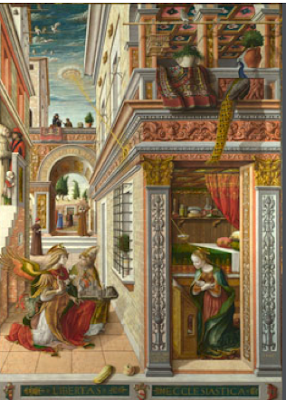 Shown at top and directly above, The Annunciation, with Saint Emidius, 1486, Carlo Crivelli, via The National Gallery, London. This is as close as I think I'm going to get to a haunted house post. Click here to learn about the amazing 18th-century digs Haskell Harris rented when she first moved to Charleston. 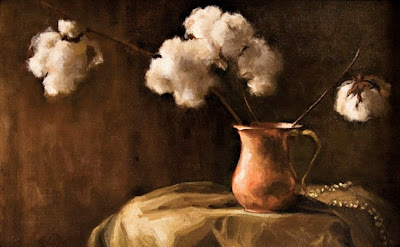 And here are a few more pics from G & G. I wanted to revisit the feature on Andrea Nutt because everywhere I turn lately I'm seeing bouquets of cotton. 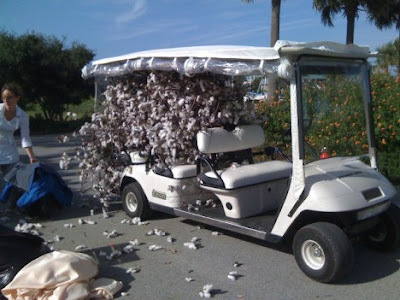 Even Tara Guérard recently used cotton for a wedding. First two pictures are courtesy Haskell Harris; Andrea Nutt holds the copyright for image three; image four is from G & G; and the last picture is from Soiree by Tara Guérard. Is it the Same Artist? Yes, it is. 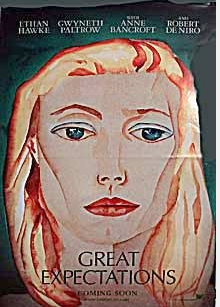 A friend asked me if Francesco Clemente, the Italian artist who painted Kelly Klein's portrait above, is the man who did the art seen in 1998's Great Expectations. In the movie, Ethan Hawke's character, Finn, is an artist and Clemente worked behind the scenes contributing all of the original drawings and paintings featured as Finn's -- even the art he does as a child. Click here for a refresher. 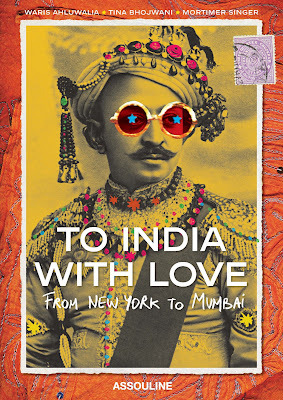 By the way, Clemente is among the contributors to Assouline's To India with Love. And if you have time to listen to the entire segment, the artist's conversation with Charlie Rose is really fascinating. 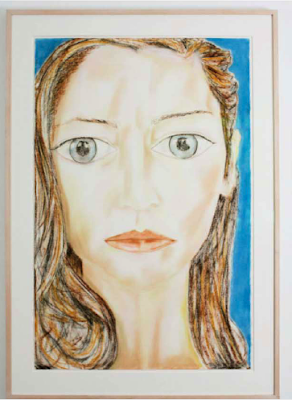 Francesco Clemente portrait of Kelly Klein, via Town & Country, October 2008; last image courtesy Assouline. As her online presence has evolved this year, artist Hayley Gaberlavage has frequently popped up on this blog but to date I haven't shared many images that show her work framed and hanging in a residential-like setting. 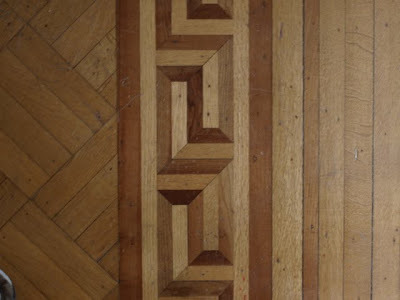 And I think for potential collectors it's helpful to see certain works paired with furniture. Something about the vignette above, photographed at Udwell in New Orleans, feels reminiscent of the interiors in 1960s movies. 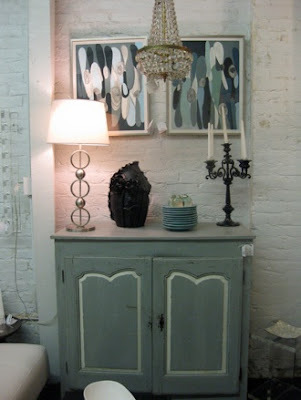 Maybe it's the mix of abstract art, French Provincial cabinet, and white-brick walls. 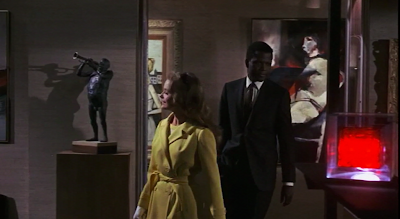 By the way, if you're researching art collections in film, Guess Who's Coming to Dinner is a great one to rent. Lots of large-scale lamps mixed with antiques too. Like photographer Lacey Terrell, Hayley favors the clean look of white or very light frames for her work. Although that style might be typically associated with more modern interiors, the look can really work in a traditional setting as evidenced by this Miles Redd-designed room, shown below. Similarly, Millie chose a perfectly understated frame for her Cecil Touchon collage. A quick reminder for Atlantans, beginning tomorrow, Thursday, October 29 from 6 to 9 p.m., Holly Bryan is hosting an open house and sale at her studio located at 3725 Powers Ferry Road. Additional hours are Friday and Saturday, October 30 and 31, from 11 a.m. to 2 p.m. 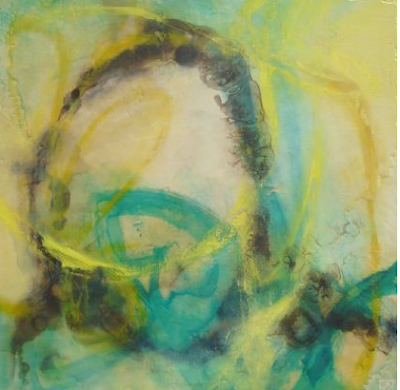 Shown above is a very big painting, Ten-Run Inning, but if you're interested in Holly's small works be sure to explore her site and inquire about her price range. 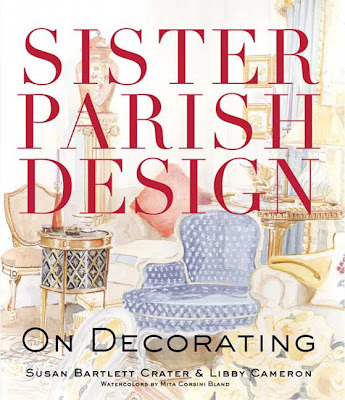 Sister Parish fans in Atlanta will be happy to know that Mrs. Howard is hosting a book signing for the new release, Sister Parish Design: On Decorating, from noon to 5 p.m. on Thursday, November 5 at 425 Peachtree Hills Avenue. Authors Susan Bartlett Crater and Libby Cameron will be on hand to greet guests, sign books and chat about Parish’s work. Sounds like a great opportunity to pick up a holiday gift. Later in the month on Thursday, November 19, from 6 to 7:30 p.m., the Birmingham Museum of Art's curator of decorative arts, Anne Forschler-Tarrasch, will discuss the Buten Wedgwood Collection. 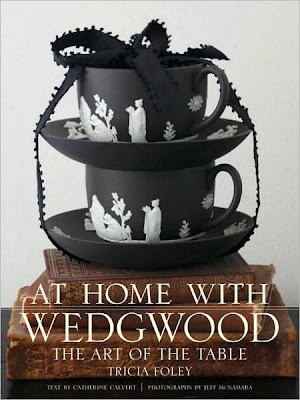 In celebration of Wedgwood’s 250th anniversary, Lord Wedgwood is scheduled to be there to present a gift to the Museum, and while supplies last, lecture attendees will receive Tricia Foley's latest book, At Home with Wedgwood: The Art of the Table, compliments of Wedgwood and signed by Lord Wedgwood. The Museum is located at 2000 Reverend Abraham Woods, Jr. Boulevard. 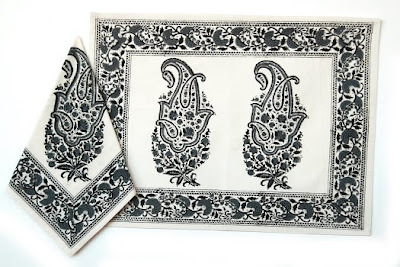 And just in time for the Thanksgiving table, Pacific & Rose is offering its popular blocked paisley print linens in new colorways including black-and-white or green-and-white. Tablecloths are also available. 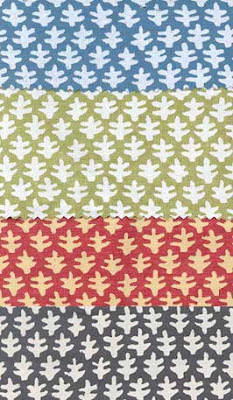 My mom has purchased some of these cotton textiles, so I can report that they are even lovelier in person and quite durable. 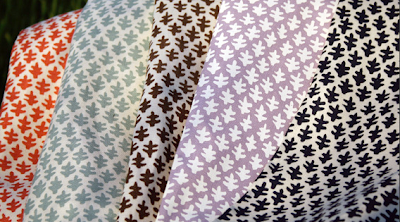 If you want to try your own hand at making holiday linens, Elizabeth continues to sell the wood blocks too. 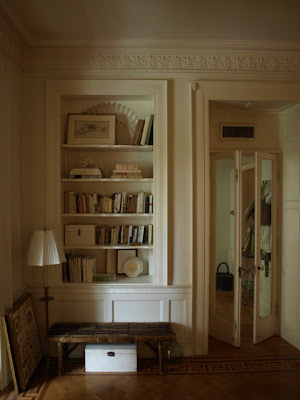 This morning I purchased a copy of Sister Parish Design: On Decorating. 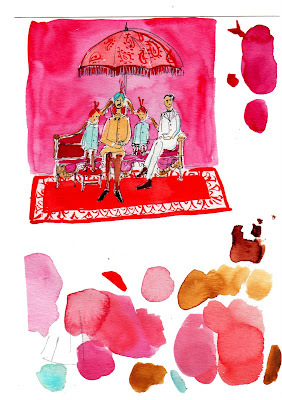 As expected, Mita Corsini Bland's watercolor illustrations are seriously charming. 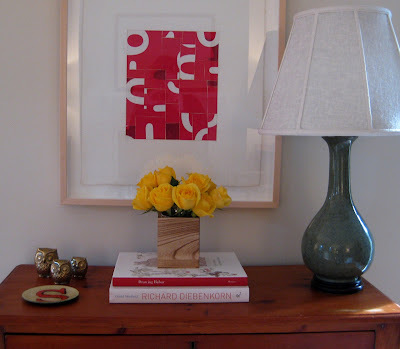 Many of her room portraits capture contemporary designs from talents such as Tom Scheerer, so that is a nice surprise. 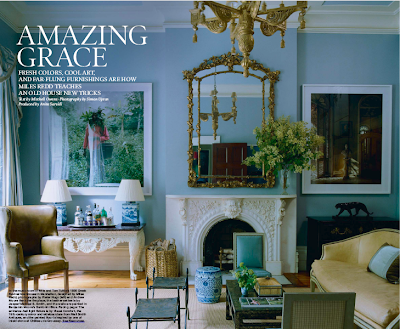 The book's tone is conversational, and a gathering of decorating heavyweights (Miles Redd, Bunny Williams, Suzanne Rheinstein, Todd Romano, Jeffrey Bilhuber, John Rosselli, Mitchell Owens, Jane Churchill and Peter Dunham, just to name a few) share what Sister's legacy has meant to their work. The topic of comfort seems to be a big theme; not simply furniture placement but the importance of a client feeling attractive and fascinating in his or her own home. In short, many say, let the client outshine the decor. Although there are interesting anecdotes peppered throughout the chapters, the book has distinct focuses ranging from how to display collections to working with textures, so I think design enthusiasts in search of a new "bible" or handbook will like the approach. Bonus: Underneath Mita's dust jacket the book is bound with Sister's "Burma" in blue. Below are the latest colorways. Oh, and yes, I'll be picking up at least one more copy for a Christmas gift! 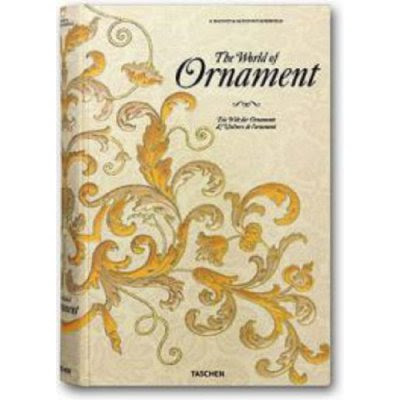 In other book news, Taschen's spectacular Ornament, a tome I covet each time I'm at Sam Flax, is now available in a more budget-friendly $75 edition. Quite a savings from the original large-scale $200 version. The new volume also includes access to an online image library with over 4000 high-resolution scans of ornamental designs and patterns. 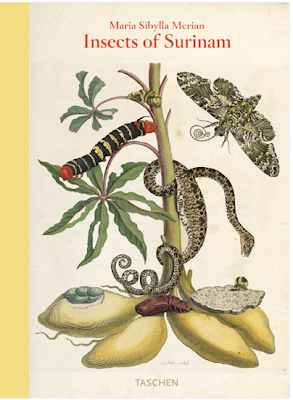 Remember this post about late-17th/early-18th-century artist Maria Sibylla Merian? Taschen has also released a lavish volume of her work. Don't miss Grant's conversation with Lord Wedgewood! 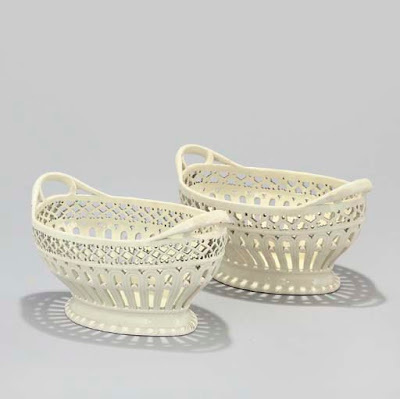 Every year I fantasize about flanking my steps with pumpkins or gourds that have been carved to resemble old pierced English creamware. 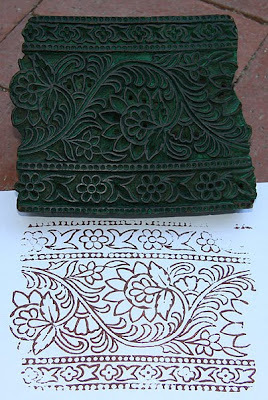 (You probably don't need me to tell you that the intricate examples above are Martha's.) For a Southern gathering of design enthusiasts, something ceramics-inspired would be timely this year because of the Birmingham Museum of Art's Buten acquisition, the largest assemblage of Wedgwood ceramics outside of England. 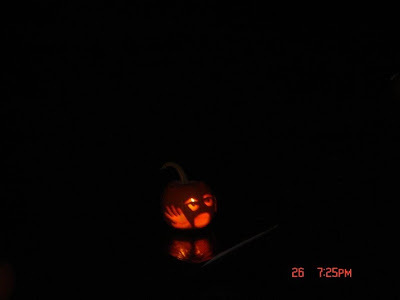 More importantly, though, pierced pumpkins illuminated by candlelight look magical on crisp October nights. So far all I've got going is this. But I know many of you are doing creative projects: putting the final touches on those costumes, battling royal icing and contributing to the neighborhood Halloween festival, or just running around town looking for the last remaining black tapers. 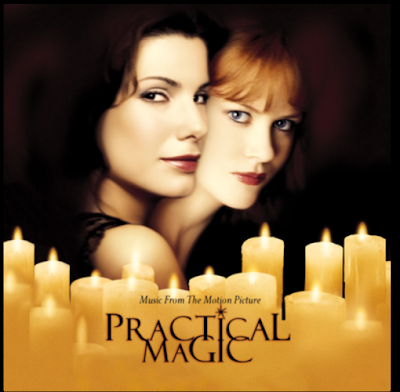 If you want a relaxing soundtrack for the last minute crafting or errand running, Practical Magic is finally available through iTunes. No Halloween kitsch, just a little Stevie Nicks and Sheryl Crow, Joni Mitchell, Marvin Gaye, and some 90s nostalgia. 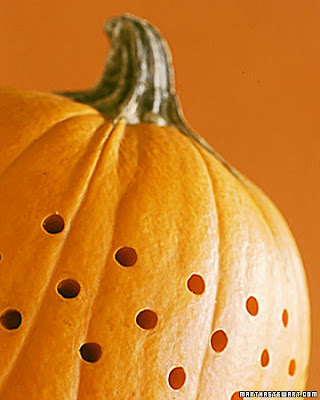 This other Martha project with simple drilled holes looks like a possibility. Have any of you tried it? 8 p.m. Inspired by the Peachtree Heights East Duck Pond pumpkin float referenced in the comments to this post. One down. Clearly a large grouping is needed for impact. We'll see what kind of damage squirrels do overnight. FYI: The Birmingham Museum of Art officially opens ts new Wedgwood gallery on November 19, 2009. Above is a shot from the Duck Pond Float spearheaded by Charlotte Margolin nearly a decade ago after she learned about Central Park's pumpkin float. Her husband and another neighbor made the original float for the Peachtree Heights East neighborhood. Peachtree Heights East's duck pond is one of the most picturesque sites in Atlanta, so on the night when local kids float their pumpkins on the water, the setting becomes even more wonderful. Later I'll be doing a proper review of To India with Love but I wanted to quickly follow up on today's earlier post and leave you with a larger version of the terrific cover. (Click to enlarge.) It's a Camille DuBois photograph of the Maharaja of Mysore. 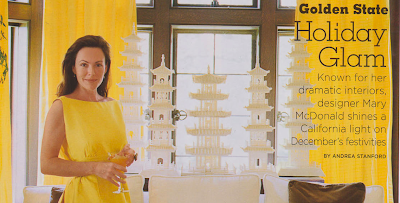 This morning I mentioned contributors to the luxe scrapbook including Wes Anderson and Diane von Furstenberg; here are a few more to pique your interest: Owen Wilson's mom, Laura Wilson; illustrator Florine Asch; Hugo Guinness, Kiki Smith, India Hicks and quite a few other creative souls. 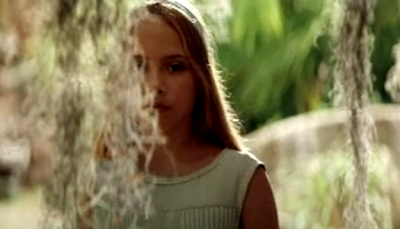 Now I think I'm in the mood to rent The Darjeeling Limited. Time for another installment of "Interchangeable Parts." 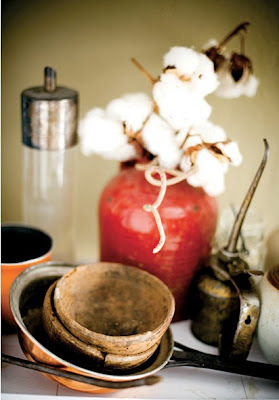 Interior designers are known for frequently changing their own rooms, often acquiring new must-have possessions and parting with things they tire of, so it's always interesting to see which pieces they hang on to throughout the years, and how they make them work from house to house. 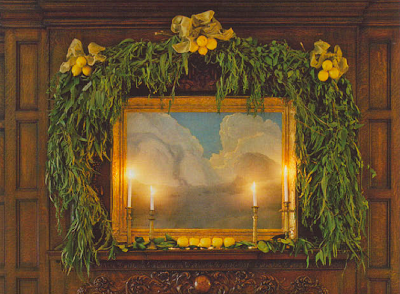 Mary McDonald inherited from her grandmother an ethereal painting of clouds by Southern California landscape artist, Clyde Eugene Scott (1884 - 1959). 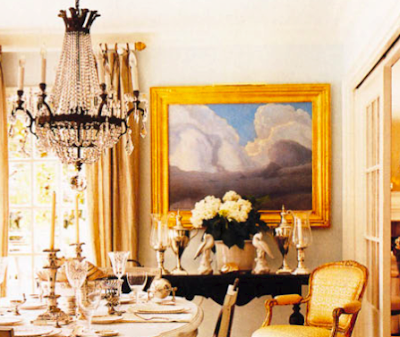 When her Hollywood bungalow was photographed by Melanie Acevedo for House & Garden, November 2001, the painting was hanging in her small, icy-blue dining room. 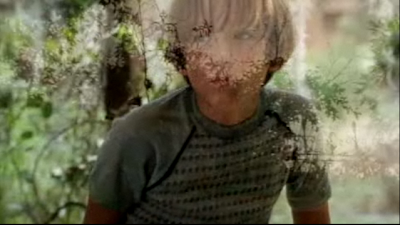 (Images three and four above.) 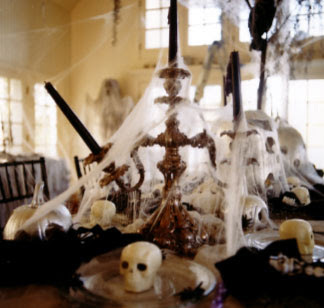 And in the same house, her collection of bone pagodas appeared in a den (again photographed by Acevedo for domino, January/February 2006). When the decorator moved to a grand 1920s Beverly Hills house designed by Elmer Grey, the Scott painting and pagodas came along, this time juxtaposed with dark wood and distinctive paneling. The soft clouds really work in both settings, and the art reminds me of one of Claudia Thompson's ideas: She suggests hunting for old damaged landscapes at garage sales and flea markets and, if there happens to be a pretty patch of sky in the painting, salvaging just that and framing it. Images one and two are cropped from Coral von Zumwat's photos for California Style, December 2008. 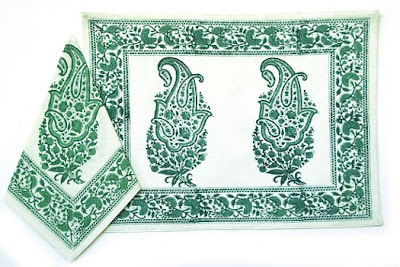 Back in 2007, I did a different post about Mary's re-use of zebra stools, pillows made from Brunschwig & Fils "Le Zebre," bone-inlaid chairs, and her signature blue-and-white ceramics. Shifting gears back to sample sales, Virginia Johnson will have her biggest sale to date with most items ranging from $20 to $50. Look for wool shawls, coats, clothes and accessories. 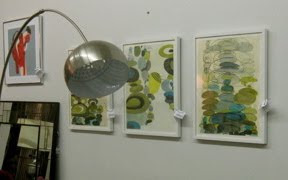 Thursday through Saturday, November 5 through 7 from 11 a.m. to 7 p.m. at Awol Gallery, 78 Ossington Avenue in Toronto. Last two images courtesy Virginia Johnson. 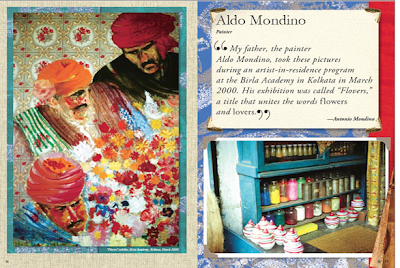 I was looking at some preview pages from the soon-to-be-released To India with Love when I noticed pictures related to artist Aldo Mondino and his circa 2000 exhibition, Flovers, inspired by the sights of India, flowers and lovers. The word "flovers" really stuck with me and I thought it could be our word of the day. 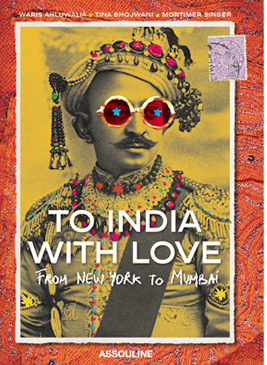 Scheduled to hit shelves in November, Assouline's lavish scrapbook has received lots of buzz, especially in the fashion press, so you may already know that this edition is meant to be a sort of love letter from New York to Mumbai. 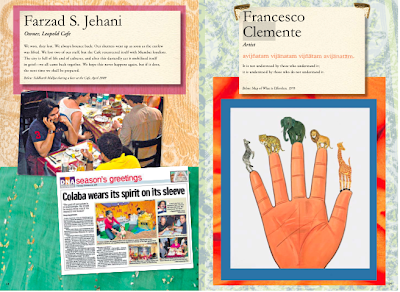 Contributors ranging from Tory Burch to Wes Anderson to Diane von Furstenberg share in the book their own personal impressions of the country and explain how the vibrant colors, the design and the people influence them. Proceeds will be donated to The Taj Public Welfare Trust and benefit victims of last year's attacks in Mumbai. Click here to learn more about the project. Pauline van Lynden's Rajasthan is a book I treasure (Seema owns it too) so I have high expectations for Assouline's 2009 release. 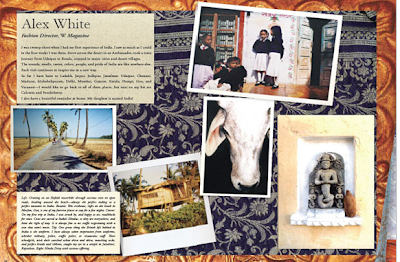 Could be the perfect holiday gift for anyone passionate about color, art, textiles and travel.